A few weeks ago (oh, you didn’t think that meant I was all caught up, did you?) a friend and I went to a cooking demonstration at a great little modern Mexican restaurant named Dos Caminos. I know very close to nothing about Mexican cooking, despite adoring the flavor palate–the sour and tangy citruses against smoky peppers and hearty beans and meats and seriously, I don’t know why it has taken me so long to try to learn a few new things. Chalk it up to intimidation. The focus of the demonstration was on fall meals, which was particularly awesome because I think we largely associate Mexican cooking with warm weather, a la pico de gaillos and fresh corn everything. I learned a ton. Like, did you know that Mennonites brought cheese to Mexico and that muenster is a great cheese to use in quesadillas? Did you know that tomatillos are the same family as potatoes? Seriously, I was just swimming in information. Oh, and delicious booziness. They made a fall punch with triple sec, tequila, black tea and a ton of diced fruit, from persimmons to guavas, grapes and pineapple that made me certain I had died and gone to heaven. But what wowed me even more were the squash blossom quesadillas. I always thinking of these delicate little numbers stuffed and battered and deep-fried, you know, the kind of thing you’d order out and adore, but not really fuss with at home. Yet they sliced and sauteed them with poblanos and onion and it was so approachable, I had to try it again at home. But when I got to the Greenmarket that weekend all eager to buy the pound of squash blossoms the recipe suggested, I was all but laughed out of Union Square. I guess people who buy squash blossoms there do so early and often, and apparently everyone but me knows not to even bother seeking them out at 4:30 p.m. Then, because I am a glutton for punishment, I decided to humor myself by asking the super-diligent produce guy at Garden of Eden if they had some–and they did! In fact, they sold them individually wrapped with a baby zucchini on the end for $2.75 each. Hoo hoo hee hee hee. So much for peasant food! So, without further ado, may I present to you my fall twist on their recipe with what I could actually get, acorn squash. We also made a quick salsa verde cruda with tomatillos which was heavenly. I’ve never been much of a quesadilla eater before–too much cheese, too little substance for me–but this has me converted. 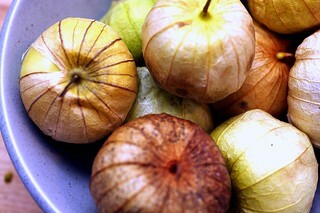 And I hadn’t ever worked with tomatillos before, but this surely won’t be the last time. The secret to getting your quesadillas crisp, Lindquist insisted, is to cook them in either butter or lard, and no skimping. A griddle is best if you have one, but a regular old frying pan will do in a pinch. 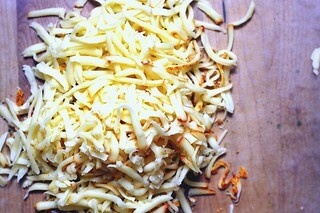 When cool enough to work with, use a paring knife or your hands to peel the skin off each slice. Lightly chop the squash and put it in a bowl. Saute the onions, garlic and jalapeno in the oil until translucent. Add the poblano strips and cook for a couple minutes more. Add the squash and cook for another 5 or 10 minutes, until the squash is tender and the flavors have melded. Season with salt and pepper and take off heat. 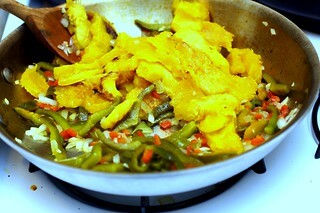 Spread a few tablespoons of the cooked squash mixture onto one half of a 10-inch flour tortilla. Sprinkle with a couple tablespoons of the cheese. Fold over and place in a hot pan with melted butter, and fry until crispy. Cut the finished quesadilla into four triangles and top with your choice of garnishes. Eat while warm. Puree all ingredients together until very smooth either in a blender or food processor. Season with salt. Yum! I’m not such a huge fan of squash blossoms, anyway (they can be bitter) so acorn squash is perfect! Holy Wow, that looks good. It totally makes me wish I could eat cheese. so i’ve actually been saying to myself, “i need a good recipe that involves tomatillos” and here you go and post one. i’m making these tonight, hands down. Those look and sound incredible – for someone who claims to know little about Mexican cuisine, you tackled it well! I went to the grocery store this morning and acorn squash was on sale for 99c/lb so I bought one, not having the slightest idea what I was going to do with it. I think this is fate! Saturdays at Dos Caminos are a bit of a tradition for my family when we’re in NY. Free margaritas at brunch! This looks like a dish I would like to taste. That must have been a great time at the demonstration. Yum! My mom always makes enchilada sauce fresh by cooking tomatillos. It’s so good. An outdoor grill works wonders in making a quesadilla ultra smoky and crisp, if you are fortunate to have access to one- and no fat needed. I love quesadillas and we make them often with just about anything inside them. Just a touch of cheese is all that’s needed to make them adhere and I’ve made a sweet potato and gouda blend that is killer good. Must make immediately! And thanks a million for the muenster cheese tip. I never know what to use in Mexican recipes. Why is it that grocery stores (Whole Foods, I’m looking at you) sell every fancy cheese from around the world, but they never have any Mexican cheeses — even though there are tons of Mexican immigrants here?? Yum, yum, yum, yum, yum! This looks delicious. I LOVE Mexican food and love even more that you’re studying up and sharing the goods with us. Thank you! As a Texan in exile I have a suggestion to push your new Mexican food acquaintance a little further. When/if you get tired of tomatillo salsa, cooked tomatillo sauce/salsa verde is about the easiest sauce in the world and makes amazing enchiladas and chilaquiles. Basically, take the ingredients above (leave the garlic unpeeled and the jalapenos whole; I would skip the allspice) and boil them until tender. Toss them all in a blender (removing garlic peel and jalapeno stems, and adding maybe cilantro or epazote or oregano) and puree. Heat lard or oil in a big pan til shimmering, *carefully* add the puree (spatters! ), and let it sizzle until it reduces and darkens a bit. Pues, salsa verde. Some people add stock at this point and let it reduce again, but it’s not necessary. So yummy. Anything can go into a quesadilla! They’re just as good as omelettes for using up bits and pieces of leftovers, though cheese is always the binder. I make them for the family at least once a week. I keep a small jar of canola oil and a silicone brush in my cupboard by the stove, and that is what I brush on the tortillas before they hit the pan or griddle. It doesn’t take hardly any to make them brown nicely. Oooooooooooh, I LOVE tomatilla salsa, to the point where the red salsas don’t even get a second look anymore. Try roasting the tomatillas (no husks) first next time in the oven on a large flat baking sheet, turning them as they char. Adds a different flavor depth to the salsa. My roommate made green enchiladas the other day and it was my first time trying tomatillos as well, and oh my god they were so good! Her recipe sounds similar to Maryn’s (#16) but I think she blanched the tomatillos and sauteed the other ingredients (jalapeno, onion, garlic). Then it all got pureed and simmered down and it was heavenly. I’m curious to try the raw version now too! Looks delicious. I love squash tacos, so I’ve got to try this quesadilla. Question – do you have the recipe for the drink with the triple sec, tequila, black tea and fruit? I could probably figure one out but it sounds too good not to try. I always plant a few squash in my gardens just for the blossoms. We love them fried with green chiles & cheese inside. Squash blossom poppers of sorts. I’ll have to give squash quesadillas a try. We’ve been trying to eat more seasonally, and this definitely fits the seasonal menu! awesome timing – I have a acorn squash on my desk, and a bowl of tomatillos in my kitchen. What beautiful photos, as always. I love acorn squash but it kills my hand to cut it. I have a sharp knife, but it doesn’t really matter to the squash. It doesn’t care about my Global chef knife. What is you trick to cut it so perfectly? Please do tell. Those Quesadillas look extremely good! A marvelous recipe! I really love that kind of tasty food! These look SO GOOD. I would think you’d need less cheese since the squash would add creamy texture. I might try this with butternut squash or pumpkin. I don’t know why but I feel like pumpkin might be good with mozzarella, or maybe a cheese that’s mildly sweet. Correction: pumpkin and mozzarella would NOT be a combo to try with the other mexican ingredients. but in general, a good veggie/cheese fall combo! Being a long-time quesadilla fiend, I can’t wait to try this one. I’m thinking about making them when my sister comes to visit. Would it be possible to share the punch recipe? Sounds fantastic as well! Beautiful photos, as always. I have an unrelated question: can you recommend a stuffing recipe? (preferably one with sausage, or bacon or some other kind of cured meat to satisfy the men at my table)? Every year my family tries a different stuffing for Thanksgiving and the traditional ones are bland, the cornbread ones are dry, the pineapple ones are clearly meant to go with ham and not turkey… I know it’s a bit early for this sort of thing, but I was about to start making a batch per weekend in an effort to find a good one before Thanksgiving and I then I thought about what my hips would look like 6 weeks from now if I actually followed through on that plan. Any thoughts? You know it’s funny you mention being intimidated by Mexican food. I always make the excuse that it’s too labor intensive, but I’m secretly intimidated. I live in Texas and just about every restaurant here has their own version of Mexican food. So, we always just eat Mexican out… Except for Christmas… it’s always enchiladas or tacos. Acorn squash sounds like it’ll be much better suited for the holidays though. We might just give these a spin this year! Oh – and I have to agree on the cheese… Muenster seems to be a great sub for some Mexican cheeses because it has the perfect degree of meltiness! I LOVE Mexican food and I love cooking Mexican food and I have never used squash blossoms–for all of the reasons you encountered. When I grew zucchini I kept swearing I would, but I couldn’t bear to cut off the promise of the actual zucchini if that makes any twisted sense. This recipe looks great–thanks for sharing. It is going into the to-do file. I have had decent results with a couple drizzles of olive oil in a nonstick pan for a lighter alternative, although it is not quite as good. Habana Outpost has a yummy quesadilla with smoked cheese which might be interesting with the squash. And Trader Joe’s handmade tortillas are the best I’ve found though there have got to be more authentic places to get some. I have an acorn squash just waiting to be made into something tasty! I’ll have to give this one a try! It figures that I made my own, idly waiting acorn squash into plain old squash last week. Alas. Tomatillos are related to Potatoes? I know that they are in the gooseberry family but had never heard that one. I made (a version) of these tonight. Loved. My husband and I ate them GONE. I’m still reeling. “Too much cheese.” ….wha? This is possible?? 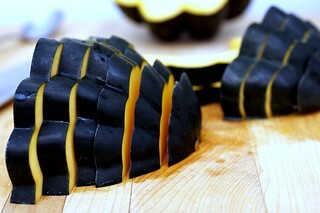 I’ma go get some squash and make these tomorrow night. What?!? No recipe for the deliciously boozy fall punch? I’m disappointed. It would accompany your other two recipes so well. This looks utterly fab! As a native Californian I can dig it the most. Another very refreshing drink is jamaica, that is to say, pronounced to rhyme with Formica, Ha-mica. Which is a tea made of dried hibiscus flowers, with sugar added. If you mix jamaica with lemonade and vodka, heaven is not too far! Wow – this looks fantastic! I must try it. And I will confess my lazy quesadilla tricks. A) bake them (two at a time) on a sprayed cookie sheet, then flip. B) Cut them after they have cooled a tad with a pizza wheel. 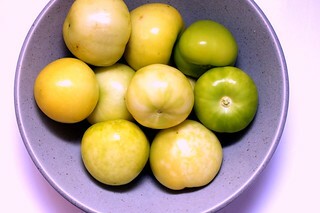 I’ve never tried the tomatillo raw in verde. We puree pretty much the same ingredients as your recipe, but then toss it in a fry pan with a very little olive oil and saute it for a few minutes. It heats it just enough to render some juice while still retaining the brighter green color, then squeeze a little lime juice on it. We toss in lots of cilantro after it cools. I love dipping grilled cheese sandwiches in it, too! I can’t wait to make these! One suggestion, for anyone who’s interested, is to make homemade tortillas. I had always bought the packaged kind and a few months ago decided to make them from scratch after I saw a recipe at the Fine Cooking website. They are SO easy and SO good. You’ll never go back to storebought! I went to Dos Caminos last fall when I was visiting New York, and I had the BEST meal. I ordered their pumpkin empanadas for dessert, SOOOO good! Which reminds me, the pastry chef was talking about how Mexican tastes and American tastes don’t always blend. For example, he said that a popular dessert this time of year is candied pumpkin, something most Americans can’t get their head around. So, they make them into empanadas (like yours!) or fold them into crepes, and everyone is happy. Ugh, I didn’t even tell you guys about the crepes with homemade vanilla bean cajeta (goats milk caramel, like dulce de leche but tangier), dusted with canela (Mexican soft cinnamon). I didn’t want to be cruel. Argh, this is killing me! I’m stuck over here in the UK, and have yet to see tomatillos anywhere. I don’t think I can justify a 2 hr trip into London (where I’m sure they could be found) every time I feel like tomatillo salsa! I love these photos of yours! The cut up squash is absolutely gorgeous. Great combination of ingredients for quesadillas. I just wish I had a good gluten-free tortilla. Brown rice tortillas just don’t cut it for stuff like this. These big, fluffy white flour ones are the best for quesadillas. Sniff, sniff. What a fun cooking demonstration you attended!! And WOW do those quesadillas look brilliant – ¡Olé! (sorry, I couldn’t resist, haha). As for the squash blossoms, another reason to buy them as early in the morning as you can is because they wilt very quickly out in the elements at the market. it’s best to get them while they’re still perky and put them in a sealed plastic bag (with lots of air inside with them) and put them in the crisper drawer of your fridge until you’re ready to use them. They’ll last about 2 days that way. Hope that helps! I really appreciate how your blog features specific recipies instead of meaningless meals. The photos are really amazing too, so sharp. My dream is to be able to cook like this as often as you do. Have you ever tried making manti? They seem right up your alley. Longtime fan. Just love you. As for quesadillas, I live in Texas and I’ve never used any type of oil or butter to cook them once assembled. If you have a good non-stick skillet or a well seasoned cast iron griddle you simply assemble and place as is on the pan. The lard in the flour tortillas and even corn tortillas will crisp them…I rather prefer them brown but soft. I’m not a chef by any stretch of the imagination. (Which is why I regularly visit your site). So glad you shared this. I don’t cook Mexican foods as often as I should (we love Mexican food, just tend to go out for it), so this gives me some inspiration to get into the kitchen and dive in! These quesadillas look fabulous. This is great. About a week ago my annual squash craving kicked in! I dabble with Mexican style dishes a lot and really want to learn how to use tomatillas. Ooh! Candied pumpkin, yum. – It’s a close second to my favorite Mexican sweet – milk candy. :) If you’re ever in Dallas, you’ll have to come visit the “little Mexico” section of town for some seriously delicious and authentic foods like cabrito and menudo and horchata – it’s like I’m back home in the Rio Grande Valley eating in my mother-in-law’s kitchen. The quesadillas look so delicious – I love acorn squash – and tomatillas are my favorite – I always prefer enchiladas verdes. Yum! I read this recipe at about 6:00 last night, and I was enjoying some of the most delicious quesadillas Ive ever had by 9:00. Sadly the grocery store, for the first time that I can recall, did not have fresh tomatillos, so I had to buy tomatillo salsa. I once had a similar tasting quesadilla at a restaurant, it used sweet potato instead of squash and fontina instead of munster. I think that I may try recreating it after my luck with your recipe last night. Can you share the punch recipe? That would be great for a wedding shower I’m hosting. well i didn’t cook last night, but we did go out for mexican! How could Americans not wrap their head around candied pumpkin? I mean, we like pumpkin butter, pumpkin bread and of course, pumpkin pie. We mix pumpkin with sugar all the time…………..Now, I have heard of other countries not fathoming us combining pumpkin + sweet, to them pumpkin is savory. 2.75 for a *baby* zucchini plant with its flower? You are crazy! Might as well wait until next year and plant your own zucchini and suffer from boatloads of veggies instead; they grow like weeds. Seriously. (Or beg them off anyone who has a garden.) The quesadilla looks delicious, by the way. I’ll have to try the butter tip, maybe later tonight. I’m sure I have some in the fridge at home. What with one thing and another I am probably more than a week away from being able to make these but, wow! I can’t wait. I can’t believe I’m the only person to ask, but are you going to tackle (or at least give us some approximately proportions) for the fall punch?????? That sounds awesome. So do the quesadillas – yum. I’m making those as soon as we get a cold snap here in Alabama. Not until I give the recipe a spin at home, which won’t be… for a couple weeks, at least. Sorry to be a tease! Those thirsting for more of their recipes should definitely pick up the cookbook. Everything in there looks amazing. yep… Those were amazing. Thanks for the recipe!! I adore quesadillas but always felt like they weren’t dressy enough to serve as an appetizer during a dinner party- you just solved my problem with this recipe, what a delightful fall treat! oh, those look so good! i make squash enchiladas all the time. mexican flavors and dishes lend themselves to vegetarian variations quite nicely. Whoa! This is great! I remember when I eat on greenwich restaurant I order pizzadilla some kinda similar with this one. Thanks for the share on the recipe. I’m gonna try this. This sounds amazing! I can’t wait to try it. I make my quesadillas without any lard or butter. It just takes patience to crisp them up. I use a heavy skillet or a cast iro pan or griddle. medium to medium high heat. And just keep heating and checking until the bottom is the desired toastyness, then flip and repeat. All I can say is YUM! It looks great and the only thing I would change is the amount of sour cream on the plate! I’ve never met a quesadilla I didn’t like. And these look fantastic. I bet they would be equally good with corn tortillas. Woohoo, my little farmers’ market had acorn squash, tomatillos, AND poblano chiles! Alas, I have no scallions for the tomatillo salsa, but I’m sure onions will be a perfectly acceptable substitute. I am a huge fan of acorn squash anything. 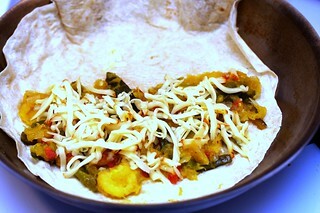 In a quesdadilla, acorn squash looks irresistable. Good, good, good food……. 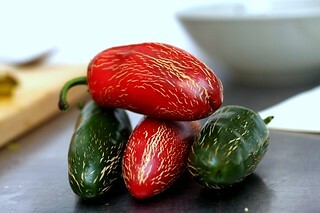 I would definitely serve them with your tomatillo salsa! wooowww! i’m so depressed that no one has introduced acorn squash to my city yet! Ever since I saw this recipe I have been eager to try it. We had it for dinner last night — delicious. Tomatillos are definitely not available at the Farmer’s Market in Portland, Maine this time of year, but cranberries are. I made a cranberry salsa that was tart and crisp — the perfect balance to the sweet soft squash and cheese. Thanks for the inspiration! Quadrupling the call for the punch recipe – I just bought 3 acorn squash this weekend at the farmer’s market, so I might try to make this recipe this week, but the punch…that might be a weekly thing, by the sounds of it. I finally got around to trying these quesadillas (I’m like you, and can never try anything without making it my own along the way, so they were slightly different) and it is definitely a keeper. We loved the salsa, and I was eating it on everything from tacos to leftovers. I was able to toast them in my Calphalon pan without any added fat too. Loved it. Thanks! I tried both the salsa and the quesadilla recipe almost exactly for my wife and sister who was visiting. I’m relatively inexperienced as a cook. The outcome was fabulous. Many thanks. Hi. I love your website and I congratulate you on also posting about the failures. You’re sincere. Other than that, I am posting to tell you that I invented a quesadilla recipe myself, which you would like: on half of your tortilla spread cheese, top with caramelized onion, top with roasted bell peppers, olives if you like them and then more cheese, and then fold the other half over. Repeat with another tortilla and place both to form a circle in a preheated non stick skillet with a tight fitting lid. Cook on medium high for 4 minutes thereabout on each side or until it roasts a bit on the bottom, then flip and cook again for approx 4 more minutes. The cheese will melt and maybe ooze and the tortilla shell will be crisp when you bite into it. Please try it ! We just rocked these. They were delicious. These were really delicious. We got a ton of tomatillos in our CSA and this was a perfect was to use them- the tomatillo salsa was bright and flavorful. Great recipe! Oh, these were soo delicious! Even my Mexican boyfriend loved them. In a search for vegetarian options (we’ve recently decided to cut back on our meat intake) I found this offering. Wow- they were soooo good! My husband, toddler, and a friend all agreed. My husband was stuffed after eating these (well, he did eat 3), which is pretty uncommon on the nights we go veggie (feeling full, that is). I used fontina cheese and doubled the recipe, which made 10 quesadillas. Yum! Delicious and easy! Was totally wondering what to do with an acorn squash and this is great! made these tonight- loved them. They were extra special with homemade tortillas. Thanks. So funny Sandra, I made them tonight for the first time too. Delicious! these look WONDERFUL. I must try them when I can get my hands on tomatillos again. a question about roasting over an open flame: I have Indian friends who use this technique for eggplant, but we have gross electric-coil skillets on our apartment stove. Is my only option using the oven? I love roasting in the oven, but it does not have an identical charring effect. Thanks, Deb! I adore your blog. I just made these tonight, for my mother and I. I was skeptical at first but decided I needed to try these – they looked too good to pass up! I am SO glad that I did. These will definitely be a new staple. Such great flavors – and I didn’t even need to put the salsa on it. I LOVED these quesadillas!!! For the past few weeks we’ve been turning more towards vegetarian meals without even trying to. I don’t know if it’s the hot summer and we just aren’t in the mood for heavy meat, but it’s been refreshing! With this turn in our culinary tastes, we’ve also had to become more creative with our meals and these quesadillas are really a fantastic addition. We’ve been doing black bean, cherry tomato quesadillas and those are great, but you can only eat those so many times. This was a great twist to one of our favorite meals and something that I probably would not have turned to myself. I love butternut squash over pasta, so I knew right away when I saw your recipe I’d love it! Making and eating it confirmed my thoughts!! You’re always full of wonderful ideas and have such wonderful recipes to share! It’s always a treat to see what you’ll share with us next! Thanks!!! Scrumptious! I’ve been wanting to make these forever and finally a family member had an excess of tomatillos and poblano peppers. It was fate. 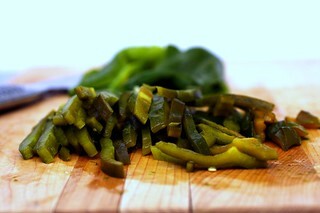 I found the roasting and peeling of the poblanos to be more time consuming than expected, but well worth the effort. They were delicious! I used whole wheat tortillas and garnished with greek yogurt (instead of sour cream) and the salsa verde cruda and they were perfect. I will definitely be making this recipe again. Thanks again for a wonderful recipe! This was a wonderful recipe. The first time I made it, I only put one jalepeno in the salsa and it was too spicy for us! The quesadillas were fantastic, also a bit spicier than I like. I made this last night for my boyfriend and I, and upon hitting the overly-small grocery store by his apartment, I had to make many subsitutions (butternut squash – not acorn, a mix of bell peppers and jalapenos roasted instead of poblano, and canned tomatillos + white onion for the salsa). Regardless, it still made for a delicious fall dinner and I will absolutely make this again! Thank you for the wonderful recipe! I need to echo the last comment. Made this last night with lots of substitutions (roasted a sweet pepper instead of the poblanos and added broccoli) and loved it. I never really get that excited about acorn squash but this recipe was perfecto. 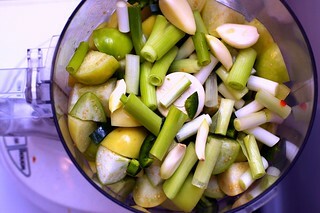 I always use a tomatillo recipe that calls for boiling the tomatillos. I like it so much I’m afraid not to boil them. So delicious! I was looking for a new mexican recipe and had an acorn squash along with some local salsa already in my kitchen. I roasted a red pepper along with the poblano pepper and served the dish “fajita style” instead of in a quesadilla. Loved it. Thank you for sharing. Just made these tonight – they were awesome! Although I used canned hatch chiles instead of poblanos because I had them on hand. Super tasty. I also made my own sauce out of sour cream, the leftover hatch chiles, salt, and hot sauce. Loved every bite! PS I recommend buying uncooked tortillas from the store and frying them up just before using. It is very little extra effort and time. The taste and texture are fantastic and so much better quality than those that have been sitting in the grocery store for a few days. Wow! My friend and I had a dinner party last night, and these were the star. We were doing a vegan meal so we made these using vegan cheese (which I was nervous about) but wow – they were incredible. We grilled them on my panini press and ended up with triangles that had really appetizing looking grill marks on them. The acorn squash was genius. Thank you!! Yum! I just made these. Actually, I made the squash mixture yesterday. Then when I got home from work today and needed a snack, I spooned the mixture on tortillas, added the cheese, sauteed, and voila! Such a delicious treat. 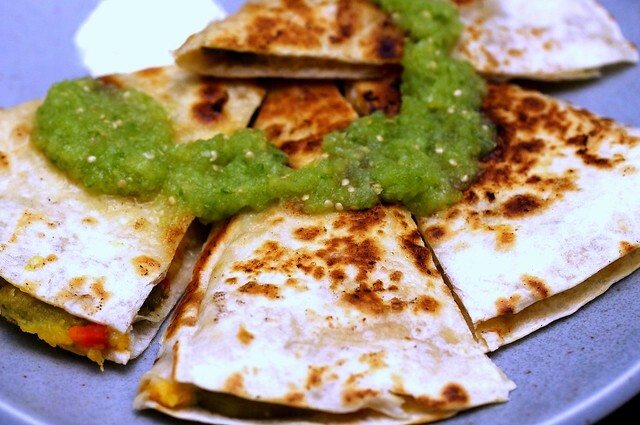 The quesadillas look yellow and cheesy but are lighter and nuttier than your typical kind. I like them because I don’t feel so full and lethargic after eating them. Thank you! Wow. Just wow. So I made these tonight for dinner and introduced them as “squash quesadillas by our new friend Deb”. Everything about them was right on, although the universe hatched a plan where it obviously didn’t want me to find tomatillos today, and so I ended up paying out the wazoo for some (admittedly delicious) heirloom tomatoes and making a regular old salsa. I’m definitely throwing this recipe into my arsenal; it was a total hit and yes, go for the butter! Also, I must have been living under a rock, because I just learned about you and your fancy site this week. I’ve wasted no time in pouring through and salivating over your recipes, lovely writing, and incredible images. These quesadillas will be the first of many Smitten recipes to come out of my (equally tiny) kitchen. I love this recipe. I have made it a couple of times and really enjoy it. I just made it for my parents who are not adventurous eaters and they both really liked it. 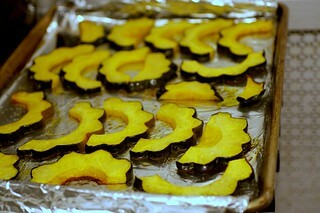 I find it is much easier to cut the squash in half, scoop out the seeds, then roast it. I then scoop out the squash and mash it a little when adding it to the saute mixture. 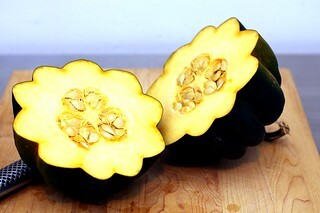 I find it’s much easier this way than to cut the squash up and then peel it and cut it after it roasts. I would think it tastes the same with just roasting the squash when cut in half. If you want chunks of squash you don’t have to mash it a little after scooping it out of the shell. Delicious! I can’t wait to make this several times this fall! I also like to put the squash mix on the tortilla and top it with the cheese then another tortilla and bake it until the cheese melts. I prefer this to frying it in butter. THANK YOU for this recipe. It is EXACTLY what I was looking for!!! It is obvious that you tested it well, so I will be making this for dinner tonight! This is delicious! I’m going to add some black beans for the added protein! These were so good! Even the leftovers were good. Everyone who came into our home that night and the next morning mentioned how good the house smelled! We will definitely make these again. I finally got around to making these and wow, so good. I just made the quesadillas, not the salsa, and we topped them with sour cream + some spicy corn relish we had in the fridge already. I love fall/winter squash of all kinds, but usually turn them into soups or purees or just roast them with butter and brown sugar – so this was a really nice change. This is a great recipe! I never thought of using acorns. It’s just not a traditional Mexican ingredient. I’m always up for vegetarian dishes. My family is Mexican, and I’ve been privileged to a lot of authentic Mexican cooking. Though, I feel like I’ve perfected salsa verde. You can find it in my e-book. Made this for supper tonight, and it was fantastic! Loved the complex, fall Mexican flavors. They paired especially well with a simple kohlrabi slaw (shredded kohlrabi, lime juice, cilantro, salt and pepper) and some sour cream. Saw this recipe and had an acorn squash on hand. So I had to make this. Then I had to run to the store for tomatillos because the salsa looked tasty. I blended all the raw salsa ingredients down (with lime juice and cilantro) and then put them in a warm, ungreased skillet to cook down. Very good. By the end, I became lazy and only made corn tortilla tacos with this. Still it was amaze-balls. Thanks for a veggie Mexican recipe. Mucho <3. Made these tonight with an acorn squash from our CSA. Used Muenster cheese. We also made the salsa, and added avocado and cilantro. It was all so delicious! Deb, I love your recipes – the perfect balance of healthy, fresh, convenient, and yummy. I was looking for something to make with tomatillos and I knew you wouldn’t let me down! I made these tonight and they were great. I cooked the onion, garlic, and squash in coconut oil instead of vegetable oil since I heard that vegetable oil isn’t as healthy (of course I guess the oil in the tortillas wasn’t good either). I only had a few tomatillos so I also mixed in tomatoes in the salsa. I had no peppers but it was still good and spicy (I guess the allspice gave it plenty of flavor). I too love almost any kind of squash….almost. I’ve only tried acorn squash once…about 9 years ago. I wasn’t so fond of the texture, but I think we just baked it and salted it. So when I got 3 in my local produce co-op basket, I wanted a recipe so I could venture into the acorn squash world again. Since my husband will try anything Mexican, I figured this will be a great one to try! Here’s to new adventures! Thank you! Okay, so I’m 4 years late to this recipe, but I had an acorn squash laying around (as you do), and found my way to your site via your NYT profile. Just finished eating the last of the quesadilla triangles. Even without the salsa (was too lazy and hungry to run to the store for tomatillos), these were outstanding. Thank you so much for the recipe, and congrats on the cookbook and all your success! This is yummy! I used a butternut squash I had instead. The salsa verde came out WAY spicy :) We love spicy food and it was hot even for us. I know jalapeños vary a lot in terms of heat. Hmmm… I’d love to know how to use the squash blossoms in this recipe. Like you, I only think of stuffing the, with risotto and lightly frying them…. Just finished eating this for dinner! Awesome! I got both tomatillos and acorn squash in my share last week. I didn’t use the poblanos and I used canned jalapeño in both the filling and salsa. Can’t wait for my hubby to try it! Loved it, but my tomatillo salsa was a little off, I added some lime. The lime helped the salsa but definitely clashed with the squash in the quesadilla. My quesadilla itself without the salsa and a some bottled El Pato on top was great. I will make this again. Thank you! I love that plant family! Other nightshades (aka solanaceae) are tomatoes, tomatillos, potatoes, peppers, and also tobacco and eggplants (the ones I don’t like). Read this yesterday, made it for lunch today! Fantastic. I used prechopped butternut squash instead of acorn, since I can’t stand puttering around with acorn. Changed proportions slightly, as I only bought one poblano. I stumbled across this while looking for something else. I just wanted to tell you that I first made this back in ’08 when you first posted it….. and I still make it. It’s my go-to when I have acorn squash. I’ve found this is pretty much the only way I like acorn squash. Great recipe. Thanks for tips. Would like to get your blog via eMail. Thank you. Hi Bev — You should get a confirmation email in your inbox. Question in the squash category, is there a reason in your recipes page why “summer squash” has so many fewer entries than “zucchini”? I think of zucchini as a subset of summer squash, the way you’ve grouped this recipe in the winter squash category. I was confused looking for summer squash/zucchini recipes why I couldn’t find more until I realized they were split up! Just a note/thought. I just made this, and I’m about to make it again. It’s really such an excellent combination of savory and spicy flavors. Every friend I’ve mentioned my recent dinners to has literally groaned, it sounds (and is!) that good! 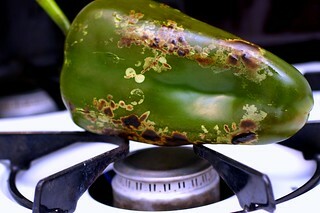 I don’t have a gas stove, though, so I didn’t roast my poblanos. Any idea of how to do this without a gas stove? Does your oven have a broiler? Works well too. FYI, Some grocery stores sell the squash cut up. I know it is not the same as cooking them in their skin, but it is a time and mess saver. Also, for gluten free, I make a crepe using Schar’s flour and recipe. Makes for an adequate substitute when I cannot get good corn tortillas. This looks yummy. I may use Delicata squash instead and blue tortilla not flour why not? My children unhepfully stood behind me while I cooked sharing all the reasons why they couldn’t eat this: squash! Peppers! Onions! All mixed together! I ignored it all. Needless to say, they devoured it; cheese always wins. I loved it, too! Hello! Made these for lunch and we thought they were very good. I did find myself wishing for slightly more detailed instructions, though. I had the squash all roasted and was ready to start sauteeing then realized that the recipe called for the poblanos to be roasted. Some of this confusion probably came from the fact that I had the recipe printed, with no pictures. So then I came online to check for instructions on roasting and peeling the poblanos and unfortunately didn’t find any here. I had never worked with poblanos before, and didn’t have a gas stove as demonstrated in the pictures so I just roasted it in the oven and winged it. And then when I came online to look at the instructions I noticed that you roasted the jalapenos in the photos as well, which isn’t mentioned in the instructions, and I had already cut mine up! It was all good because the quesadillas still turned out well, but as I know you sometimes refresh old recipes, I nominate this one as a candidate for refreshing! Thanks for your consideration and as always for the great veggie ideas!